His Eminence Norberto Cardinal Rivera Carrera, Archbishop Emeritus of Mexico City. He was born June 6, 1942 in La Purisima, Tepehuanes, Durango, Mexico. In 1955 he entered the seminary of Durango, and later earned a doctorate in theology from the Pontifical Gregorian University, Rome. He was ordained a priest on July 3, 1966 by Pope Paul VI. In 1982 he became professor of ecclesiology at the Pontifical University of Mexico. On December 21, 1985 he received episcopal ordination from Pope John Paul II as Bishop of Tehuacan. 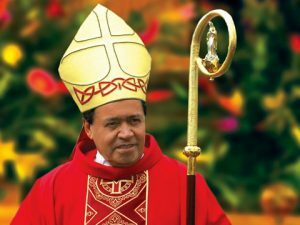 From 1989 to 1995 he was chairman of the Mexican Episcopal Conference’s Commission for the Family. He was also a member of the superior council of the Pontifical University of Mexico. On June 26, 1995 he was installed as the Archbishop Primate of Mexico City. He was created and proclaimed Cardinal by Pope John Paul II in the consistory of February 21, 1998. 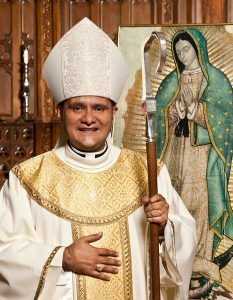 He continued his service as Primate of Mexico until his retirement on December 7, 2017. Msgr. 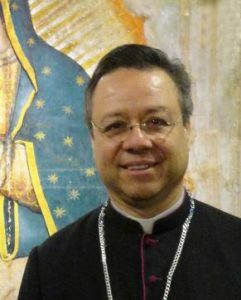 Eduardo Chavez is co-founder and rector of the Institute for Guadalupan Studies, and is a canon of the Basilica of Guadalupe. Born in Mexico City, he studied philosophy and theology in the Institute for Ecclesiastical Studies at Mexico’s Conciliar Seminary. He was ordained on August 15, 1981, in the Archdiocese of Mexico City. He holds a diploma in philosophy from the Universidad del Valle de Atemajac in Guadalajara and a doctorate in Church history from the Pontifical Gregorian University. On May 17, 2001, Norberto Cardinal Rivera Carrera appointed him postulator for the cause of Saint Juan Diego, who was canonized on July 31, 2002. Msgr. Chavez was also general secretary for Pope John Paul II’s visit to Mexico. Msgr. Chavez has made many contributions to the study of the Guadalupan event, addressing major academic institutions internationally and publishing more than 28 books and articles.